Speaking of hobby projects that take decades to complete, let's talk about my quilt. My FINISHED quilt! Yes, that's right...my friend's baby is due any day now, and I feverishly completed the quilt yesterday. And all it took was four months or so...for something measuring 35 inches by 52 inches. I don't know how people summon the willpower to quilt anything bigger. Now that I think about it, I guess that is the exact reason sewing machines were invented. Quilting anything bigger by hand seems to require the moral fiber of an Amish person. Since I am not, in fact, Amish, I did end up running into some technical issues while sewing. Chiefly, the fact that I couldn't figure out the quilter's knot, which is how you are supposed to end a line of stitching in the middle of the quilt without making a giant mess. Dina Who Is Not My Sister kindly sent me a link to a video showing how to do it, but although it seemed relatively simple when I was watching, I could not for the life of me actually get the needle, thread, and fabric to cooperate. So all those long diagonal lines quilted through the top? Yeah, those were each done using one super long piece of thread. 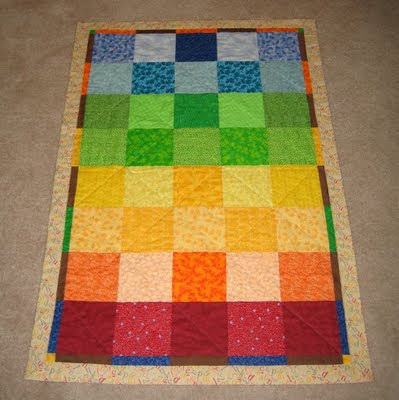 My original vision for the quilt also included very thin brown edging all the way around the outside. However, it turns out that thin borders are quite tricky, and what with the baby being due at any second, I decided to forget The Plan and just end the quilting process by folding the backing fabric over the top and stitching it in place as a border (what my Quilting for Dummies book called self-binding). The downside to self-binding is that it's supposed to be less durable than other sorts of binding. Being a fool optimist, I read that bit about 'less durable,' and then went ahead and decided to machine wash the quilt anyway. So after finishing all the stitching last night, I stuck the quilt into the washing machine on the delicate cycle, crossed my fingers, and hoped like hell that the whole thing wouldn't fall apart. I know that the lead up convinced you all that something terrible then happened, but apparently holding your breath and hoping is an effective strategy, because all the stitching held, and the batting didn't even shrink enough to notice. I thus declare my foray into quilting a wild success. I suppose there is one more judge whose opinion may be more important than mine...although for all the work I put into this thing, that baby damn well better love it. It looks awesome! Tutorial video be damned, I'm just plain impressed that you sewed those whole lines without tangling the thread into a giant frustration-y mess. What a beautiful piece! Thanks! There were a few giant frustration-y messes along the way, but I managed to untangle them eventually. The baby damn well loves it! So does her mom. She (the baby, not the mom) has a tendency to vomit milk all over everything she comes into contact with, so the quilt is currently kept away from her. I will send a photo of Meryl enjoying her quilt (allowing several hours of digestion time). Your comment made me go back and view the pictures of my glorious work. I can't believe I did that...a summer well spent!